This installation assumes you are starting from a fresh CentOS 7.x Installation with no other services installed. *php-posix required for ownCloud’s occ command line configuration software. Running the following command and answering the associated prompts will help secure the database. Use this method if you will be accessing your ownCloud installation through a domain name vs. using an IP address as shown above. In order to add instant security before purchasing an SSL (Secure Socket Layer) certificate, you’ll need to create a self-signed certificate. Use the following link to create the CSR. *Make sure you use the same files names you created in the previous steps! Since we’ll be using the ownCloud occ (ownCloud Console), and this command must be ran as the web server user, create an alias to reduce typing. alias occ="sudo -u apache /var/www/html/owncloud/occ"
occ maintenance:install --database "mysql" --database-name "owncloud" --database-user "ownCloudDBUser" --database-pass "ownCloudDBPassword" --admin-user "ownCloudAdmin" --admin-pass "ownCloudAdminPassword"
Enter https://owncloud.domain.com (replace “domain.com” with your actual domain) directly into your browser’s address bar. In the “Create an admin account, enter the username and password you wish to use for your administrator. It is strongly recommended NOT to use “admin” or “administrator” since these are easily guessed. Using other usernames adds an extra layer of security to your system. To access the storage and database configuration settings, click “Storage & database” located directly under the “Create and admin account” window. 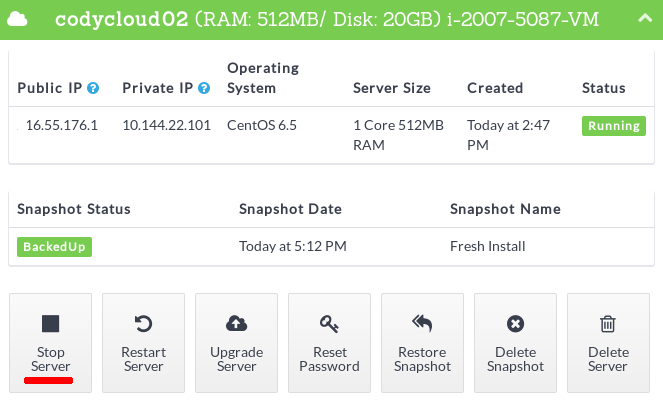 The default storage path for this configuration is “/var/www/html/owncloud/data”. Leave this as it is for now. We will manually adjust it in the upcoming steps. In the “Configure the database” window, click “MySQL/MariaDB”, then enter the username, password and database name you used when you configured the database earlier. Leave “localhost” as it is to ensure remote users cannot access the database. Click the [Finish setup] button at the bottom of the page. Close your web browser. We have some more command line work to do! 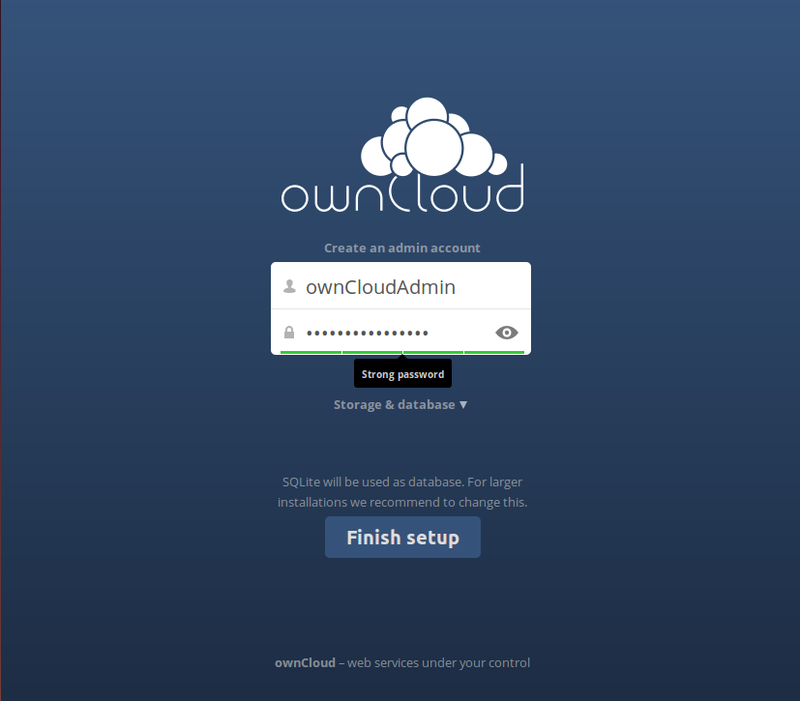 By default, ownCloud installs the data folder directly on the website’s document root. This could allow access to the folder if the site’s .htaccess or folder’s index file becomes corrupt. Instead, we’ll move it to an “off-site” folder. *It has been noted by other users that using “/home/owncloud/data” or other matching folder naming techniques tend to fail, so we use “/home/owncloud-data” which has proven to work. By admin on April 1, 2016 | Applications, Cloud, Linux | A comment? 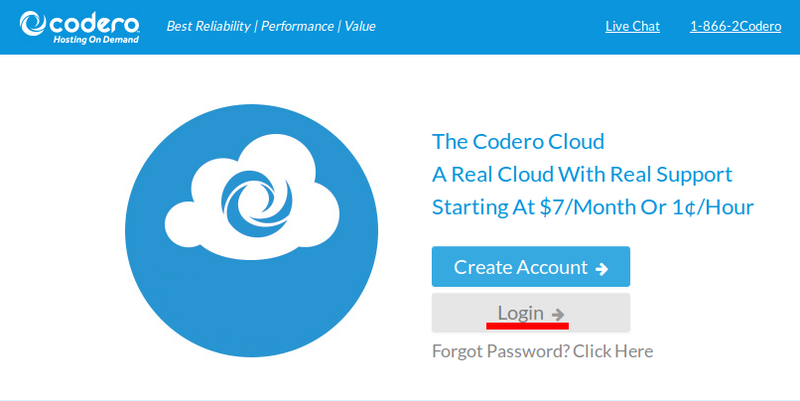 Cancelling a Codero Cloud instance and preventing further billings is as easy as destroying the instance. From the moment the instance is deleted, it is considered cancelled and no further billings will occur for that instance. Locate the instance you wish to delete. If you only have one intance, or the instance you wish to delete is listed first, the options should be displayed by default. 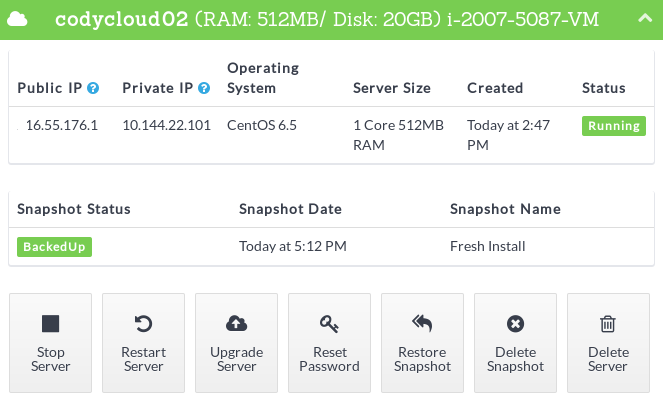 If you cannot see the options, click the down arrow located on the right side of the instance display. 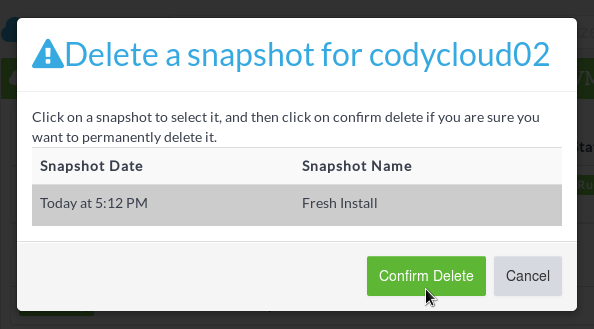 A confirmation window will appear asking you to confirm that you wish to delete the selected cloud instance. Verify you have the correct instance using the displayed hostname. 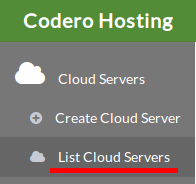 If this is the correct cloud instance, delete it by clicking the green [Yes] button. 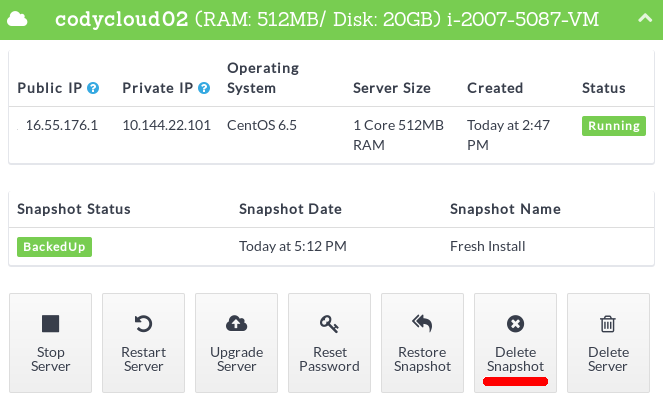 Once you delete a cloud instance, it cannot be restored. 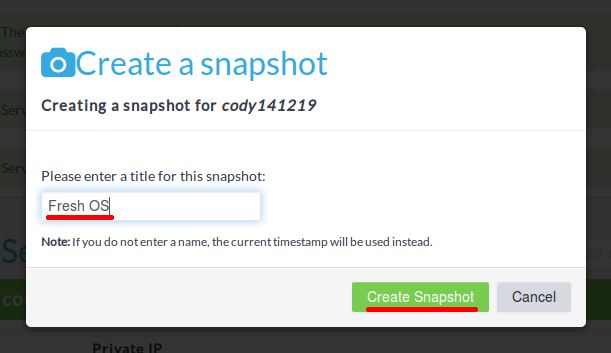 If a snapshot of the instance had been created, it will also be destroyed and cannot be restored. 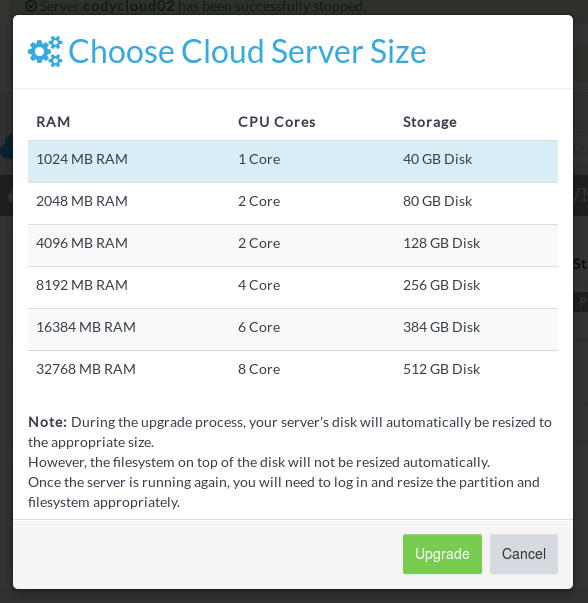 After a few moments, your cloud instance will be destroyed and you will receive no further billings on the instance. By admin on December 19, 2014 | Cloud | A comment?